In order to integrate Steam in your game, you need to download the Steamworks SDK and have steam as a client, installed in your PC. Keep in mind that you can integrate the required SDK even if your game is not officially greenlit yet. Steam provides a sample game, named Spacewars which contains all the features offered in its SDK. 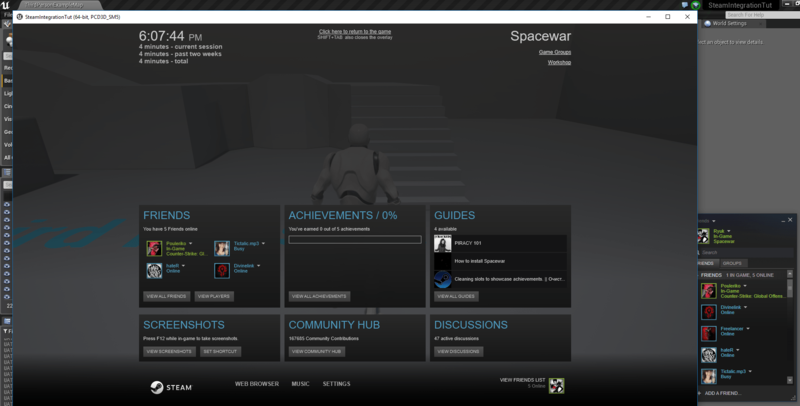 In the end result, Steam is going to recognize your game as Spacewars. This post was written in 4.14 version, in case you’re using a different version of the engine the following workflow might differ a bit. Please note that in 4.14 version of the engine, Steamworks 1.32 is included. You don’t have to download the latest SDK if that version offers all the required features you wish to include in your game. At this point, you need to add certain binaries to our engine. To do that, go to [Your_EpicGames_Path]/Engine/Binaries/ThirdParty/Steamworks/SteamvXXX and you will notice that there are two folders, named Win64, Win32. We need to add certain binaries in each folder. At this point, to test your game’s Steam functionality, you can either enable the Online Subsystem Steam plugin (found in Online Platform category) from within the editor and launch a Standalone version of your game or you can package your game and then try playing. Please note that in both cases, you need to be logged into your Steam account. In the next part, we’re going to integrate Steam Achievements in our game too, so stay tuned! For all those getting errors with version 1.3.8 of the SDK, it has build errors. Simply revert to v132 provided with engine version 4.14 and all will work. I saw that your post, it was very nice. I want to setup with SDK(v139), but it has build errors..
139 also has build errors, since I overwrote the one that came with the engine…. I downloaded 132 from https://partner.steamgames.com/downloads/list and it worked finally.